To create a duo-colored scrub, like the one pictured, you’ll need two small mixing bowls. Add 5 Tablespoons of sugar to each bowl. In a double boiler, melt 1 teaspoon of white beeswax completely. Next, add 1/4 cup of Shealoe Butter to the double boiler and turn the burner off. Be careful to warm the Shealoe Butter very gently. Overheating Shealoe Butter can cause it to separate. When it has melted completely, stir the butter and wax mixture into one of the bowls of sugar. Next, add 1/4 teaspoon of fragrance or essential oil to the bowl and stir. 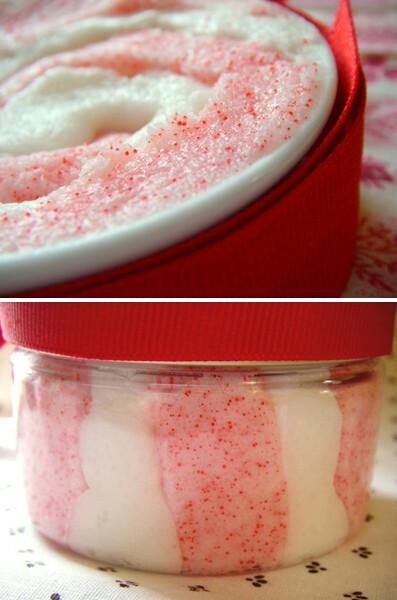 Add 1/2 teaspoon of Red Jojoba Wax beads and mix well. Pour the mixture into a resealable bag. Repeat this process with the second bowl of sugar, this time, leaving the Red Jojoba Wax Beads out of the mixture. To make the piping easier, refrigerate the bags of scrub for ten-fifteen minutes. When the scrub is ready, roll one bag’s contents into the corner of the bag and cut the corner.